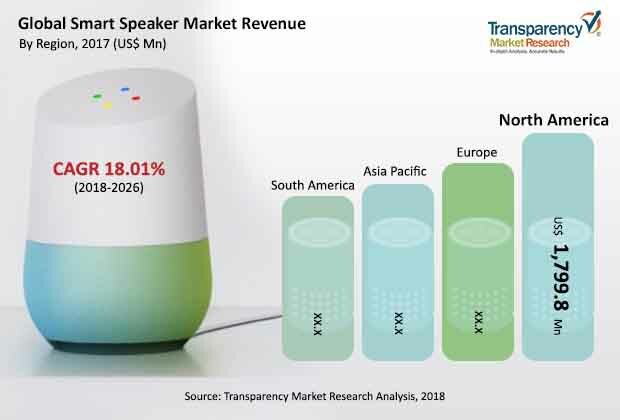 The global smart speaker market is expected to be increasingly competitive as a growing number of players are launching smart speaker technologies that offer end users with varied functionalities, notes Transparency Market Research (TMR). Astute players consider it worthwhile to adopt a mix of smart strategies to gain a competitive edge over their peers in the smart speaker market. TMR finds that prominent players in the global smart speaker market are focusing on unveiling the ecosystem of smart speakers that can be controlled with simple voice commands and intuitive voice assistant technologies. Numerous leading companies are focusing on developing smart speakers with advanced artificial intelligence (AI) technologies. Several companies are also focusing on mergers and acquisitions to bolster their productivities and consolidate their positions in the global smart speakers market. Top players operating in the global smart speaker market include Xiaomi Inc., Harman International, Amazon.com, Sonos, Inc., and Apple, Inc. The global smart speaker market is projected to rise at a robust CAGR of 18.01% from 2018 to 2026 and touch a valuation of US$18,472.1 million by 2026 end. Opportunities in Asia Pacific on the global front is anticipated to be one of the most attractive regional markets for smart speakers, and is projected to rise at an impressive CAGR of 19% from 2018 to 2026. The demand for smart speakers is fueled by burgeoning popularity of smart artificial intelligence-based devices, especially among consumers in developing economies. Among the broad modes of sale in the smart speaker market, online is expected to account for the major share throughout the assessment period. This can be attributed to the preference of several prominent players focusing on online channels for bolstering their product sales. Furthermore, online sales channels offer increasing convenience to consumers. The smart speaker market is driven by the rising demand for AI-enabled speakers across the world, especially among home users. The growth in the market is propelled by the rising demand for customizable speaker devices that can be controlled by simple voice commands and features intuitive features. The growing popularity of AI-based digital assistants capable of doing myriad tasks through easy voice commands is a notable factor catalyzing the expansion of the smart speaker market. The attractive strides that the demand for smart home devices has made across techno-savvy consumers, especially in developing and developed regions, has been boosting the global smart speaker market. The smart speaker market is benefitting immensely from the demand for advanced voice technology and voice-controlled personal assistants gathering steam among consumers in developed markets, most notably in Europe. The integration of advanced technologies by audio manufacturers is also catalyzing the demand for smart speakers. Furthermore, the advent of smart speakers that are compatible with various smart home devices is also propelling the growth of the smart speaker market. However, the market has been facing few bottlenecks from problems that can arise out of compatibility issues of smart speakers with various smartphones, such as privacy issues. Moreover, the lack of standardization in these devices is also crippling the steady expansion of the smart speaker market. The adoption of Bluetooth connectivity and Wi-Fi connectivity in wireless smart speakers has been positively impacting the demand dynamic. Furthermore, the advent of smart speakers with more smart functionalities that can be controlled by app is expected to favor the evolution of the smart speaker market. The study presented here is based on a report by Transparency Market Research (TMR) titled “Smart Speaker Market (Components – Hardware (Processor, Microphone, Connectivity IC, and Audio System), and Software; Mode of Sale – Online and Offline; Application – Commercial and Personal; Voice Assistant Type – Amazon Alexa, Google Assistant, Apple Siri, and Microsoft Cortana) – Global Industry Analysis, Size, Share, Growth, Trends, and Forecast 2018–2026”.